I have a recipe book, a recipe address book where I write down my recipes. The recipes that go in there are those that make the cut and hit the mark. 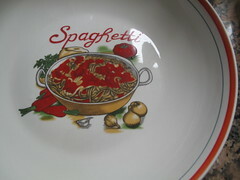 Those recipes are forever immortalized in my food hall of fame. 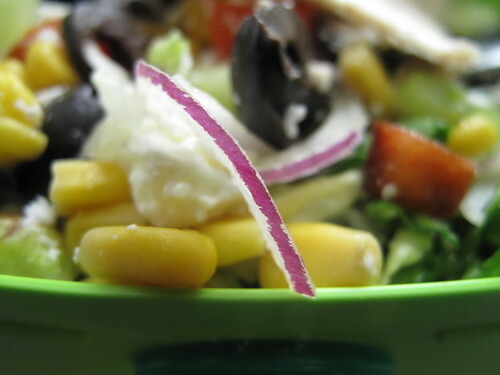 You’ll be glad to know that this salad has reigned there for almost a decade since I first discovered it while at University. I think everyone should have an address book for writing recipes…assuming you love writing like I do even in this computer age of online everything. Why I like the address book chronicling is that it allows you index your recipes alphabetically and hopefully retrieve them… very sophisticated. 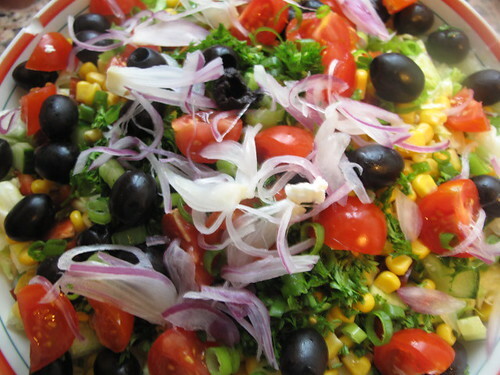 Anyway, the recipe for this salad is recorded under the ‘S’ tab as ‘My favourite salad‘ – ever! Its origins are steeped in Greece, largely because of the garnish of Feta cheese, a creamy, brine-cured curd cheese and the combination of vegetables. How would I describe it? 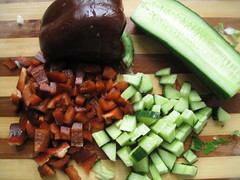 How does Salad zen sound to you – that exquisite place of balance – of sweet and sour, crunch and chewy, soft and tasty. Well my zen may differ from yours so…. don’t blame me. Anyway would living green describe it better – does it evoke smells of amazingly freshness, sweet peppers and cool cucumbers, tart olives and fresh, red tomatoes…to mention just a few? I had been slowly accumulating the ingredients for a few weeks now, ever since our street party and the mention of Dodoni Feta cheese by my Greek neighbours as being the best ever. It is pronounced in a funny way, almost like Dhodhoni… so instead of a D, you pronounce a Dh (like Th sound). Try to sound it out by pushing your tongue against your upper teeth and blowing out air as you pronounce it. Suceed? Well thankfully that’s not a test of whether you can make this salad or not. Aren’t you mighty glad? Anyway, first I got the Feta cheese and then when I went to the market in The Hague, I got some special paprika. 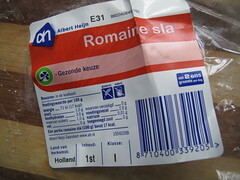 And then on the day I made it, I had completed the shopping list with the purchase of some Romaine lettuce and sweetcorn, so when my husband came to me crying of hunger, I was prepared and said to him – I’ll make a nice salad. To which he responded ‘hmmmm, you’re forcing me to have this salad (basically saying, I hope it tastes good). Confident this salad needed no defense, I set to work assembling it. 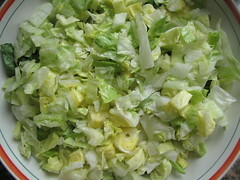 The original recipe I made called for Romaine lettuce hearts – the inner, light green crisp leaves of the Lettuce. Since I count my blessings often, I was more than thankful to find a regular head of Romaine – leaves, heart and all. 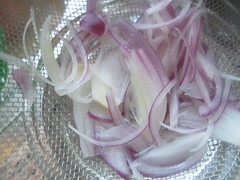 If you intend to keep your fresh fruit and vegetables in the refigerator, don’t wash them till you’re about to use them. The minute you wash them, you strip them of their protective layers and the degeneration process starts. (the only veg I wash before storage are those I intend to freeze like my chilies or tomatoes, otherwise you freeze them with all the gunk and it becomes tricky to clean them from frozen). When preparing Lettuce, tear it to bits as cutting/chopping realeases enzymes which destroy the Vitamin C. If you must cut it, do so with a silver or stainless steel knife. This slows down th release of the enzymes and prevents the leaves from turning brown. Yet another reason to avoid bagged salads some say but its better to have some greens than no greens. 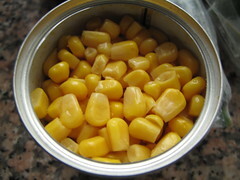 Rinse tinned/canned foods under a running tap to rid them of some of the sugars, salts and other preservatives. 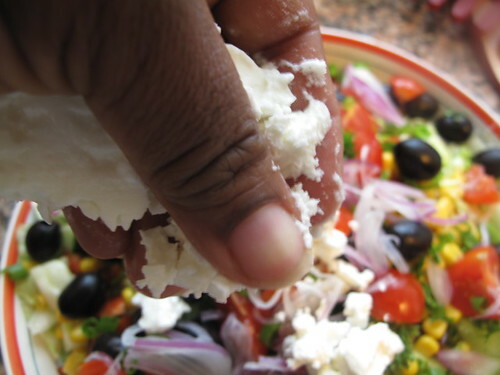 Store left over Feta cheese in a bowl and cover it with water and refigerate to prevent it drying out. Get a large salad bowl. 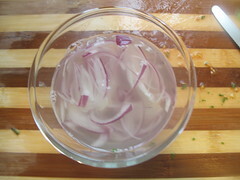 Chop your very healthy Romaine lettuce and put in bowl if you notice small amounts of a white, milky liquid when chopping the leaves worry not. This “milk” is what gives lettuce its slightly bitter flavor. 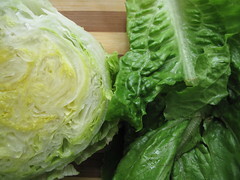 It is this creamy sap that gives Lettuce its scientific name, Lactuca sativa derived from the Latin for milk. Anyway, you don’t get healthier lettuce than Romaine. Because the leaves lack the crispiness of the hearts, I make up for some of the lost crispness by chopping up and adding half an Iceberg lettuce. 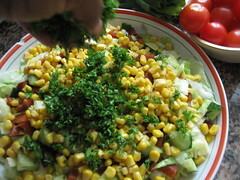 One of the things I love about this salad is the sweetcorn. One day, I’ll try it with fresh corn off the barbie…. till then, that from a tin will suffice. 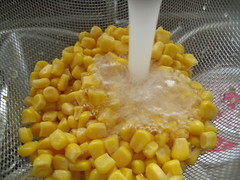 When I open a tin, I’ll pop the corn in a sieve and rinse it under running water to rid it off the sugars and salts and all the other preservatives… and then leave it to drain. While the corn is ridding itself water, I focus on the next step. My Paprika. 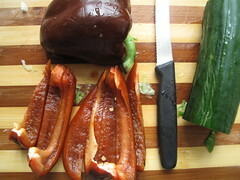 I found this strange coloured paprika in the market in The Hague and decided to give it a try. Apparently, this novelty bell pepper is called Chocolate Beauty Sweet bell pepper – They are not as sweet as red Bells but sweeter than green . They’re a dark red – somewhat browny-burgundy colour. It was sweet and quite crisp – perfect for this sla! 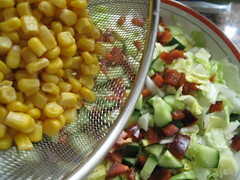 I’ll dice up the paprika and cucumber and sprinkle over the salad and then I’ll add the drained sweetcorn. On this occassion, at this very point, my husband said loudly across the room (benefits of an open kitchen right?) wow, babes I can smell the freshness of the ingredients. I smiled, my plan to have this salad for dinner was working. 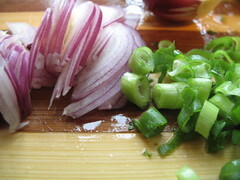 Some freshly chopped parsley goes on top next. Black Olives – not Kalamata olives though, just regular deseeded ripe black olives. I’m not a big fan of Kalamatas…. they slap my mouth, meaning they are tart and sour and not top of my list. Sometimes I slice the olives into rings (when I really have time… which is not often). 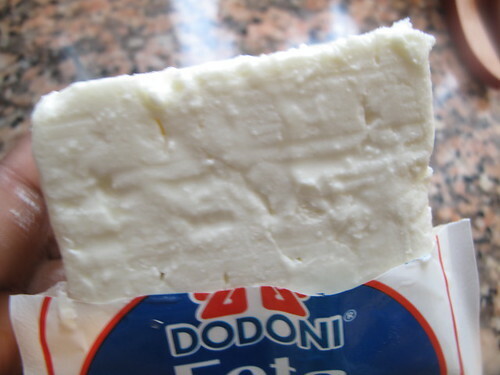 and then finally, the piece de resistance Dodoni Feta Cheese. Crumbled all over. 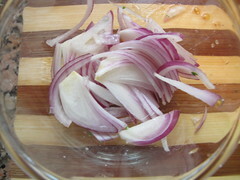 Thats not to say if you can’t find Dodoni, don’t make this salad. Nonsense. 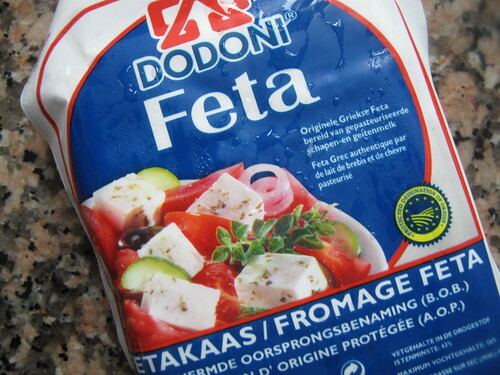 Any brand of feta would do… and if you don’t like Feta, then any cheese would do. Now if you don’t like cheese…. then I’m afraid your zen stands the danger of being out of balance. Your Salad zen I mean. 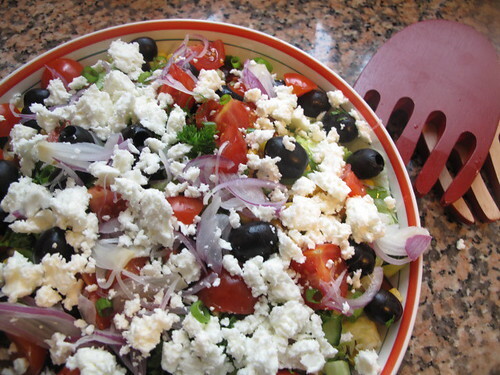 Regardless, give the salad a quick stir and garnish with some more feta cheese and a few olives if you so desire. 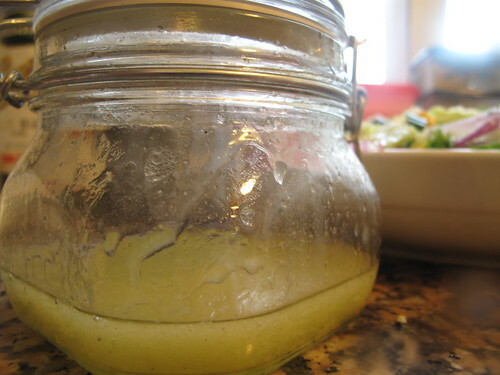 Set aside for a few minutes while you rustle up the vinagrette (3 parts olive oil to 1 part lemon juice, with a sprinkling of black pepper and salt and a dash of basalmic vinegar) and then serve with some fine bread. Dinner my Lord, is served. Needless to say my husband had 2 helpings, showered me with praise and we still had enough leftover for the following day’s lunchboxes. Perfect.